The Saddleworth fire, which started on neighbouring grouse moor and spread onto Dove Stone has damaged approximately 200 hectares (around 300 football pitches) of land. 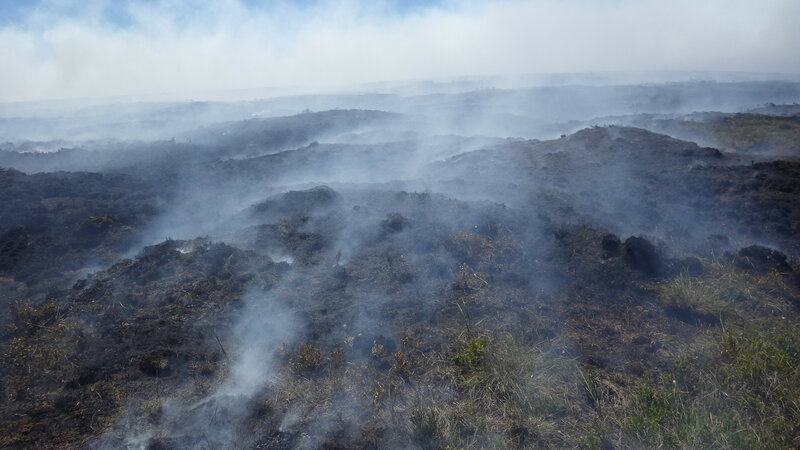 Fortunately, the blaze did not reach the main areas of blanket bog that we've been restoring on the higher plateau, although an area of bare peat restoration on the bog edge has been damaged. The fire is now out on RSPB managed land, however, there are still hot, smouldering areas of peat, which could cause the fire to reignite, so the situation is still changeable. Having assisted with fighting fires on the ground, we're now continuing to try and cool the hot areas of peat. Please continue to follow the advice from emergency services and the partners and do not be tempted to go up to the fire site to try to view this scene, and please do not leave your vehicles on any lanes that give access to the moorland locations here, as the emergency services need clear access. We would like to say an enormous thank you to the fire crews, police, and all the partners for all your hard work in incredibly difficult conditions and also thanks to the volunteers and locals who have been providing food and drinks to the agencies involved. The fire is now being investigated by the police as arson. Anyone with any information is asked to contact police on 0161 856 9353, alternatively call 101 or Crimestoppers anonymously on 0800 555 111. Please do not have BBQs at Dove Stone. Whilst it is a beautiful place that people understandably like to come to and socialise with friends and family, BBQs are not permitted here due to their obvious fire risk. Please do not discard cigarette butts – even the smallest spark can create a large fire, particularly in these dry conditions. More detailed information on the Saddleworth fire and the importance of restoring our peatland habitats for tackling climate change can be found in this blog from our Senior Land Use Policy Officer Dr Pat Thompson.